The best pool cover pump is an essential amenity. It should always be a part of the winter preparation to ensure that your pool is still conducive for swimming purposes. Technically, pool pumps are used for removing the water present on the pool cover. They also prevent the water to overflow from the pool once the former comes through the cover. The cold and rainy seasons tend to produce a lot of water. They tend to accumulate on the tarps and covers while your pool is idle. Of course, only a few brave souls would want to swim in extremely frigid conditions! Aside from this, water can cause damages to the cover. It the cover is made of tarp, too much water can rip and tear it apart. The freezing temperature is also a factor that can make things brittle. Sure, investing in a pool cover pump will render some cost. But once they are there, you can guarantee that you don't have to replace your pool cover anytime soon. We have highlighted a couple of pool cover pumps here that you might want to consider acquiring. These units have been among the top rated pool cover pumps on the market today. If you want to ensure that the covers of your pool are intact and wear-free, taking any of these tools is necessary. Do You Need a Pool Pump Cover? The role of the Little Giant APCP-1700 is pretty simple and that is to remove all the stagnant water on the pool cover. It features an automatic operation, just like the WAYNE WAPC250, for a fast and hassle-free removal of water. There is a float switch on this device that automatically detects the water level for its operation. This pump is submersible. None of its sensitive parts are exposed on the water, which is already a great relief. The intake screen integrated on this pump can be removed so that you can clean and maintain without pressure. There is also handle placed on the device for enhanced portability and placement. You can use the garden hose adaptor if you want things to be less complicated. Many pool cover pumps don't have this specific accessory, which makes them a little tricky to use. Furthermore, the pump itself can run on its own once it detects an increase of two inches in the water level. On its rating, the pump is capable of handling 1,745 gallons of water per hour. Some people just want to be frugal, right? It is the reason why some don't want to invest in pool cover pumps. Aside from its given cost, the bill it generates while it is running can't be ignored easily. Fortunately, the Little Giant PCP550 is there to provide a solution to these predicaments. Take note that this pool cover pump is not automatic. You have to manually operate it so that you can drain the water out from your pull cover. Although this is an additional task on your part, it still allows you control and efficiency. You have saved a lot of power, too, because there's no need for you to plug the device constantly. The functionality of this device is pretty impressive, too. It comes with thermoplastic components that are durable and resistant to water-related damages. The intake screen of the pump is removable for easier maintenance and cleaning operations. Moreover, this unit is using a 3/4-inch hose connection so that you can attach it quickly to your household hose. The raw power of the PCP550 enables it to pump 550 gallons of water per hour. The Blue Wave Dredger Jr. is another pool cover pump that can do the job. It has a water-dispersal rate of around 350 gallons per hour, which is pretty decent for small to moderate-sized pools. It is still a manual cover pump just like the Little Giant PCP550, which makes it a practical choice. You may have to do some extra tasks, but you can save a lot of hefty cash. After all, you have the total control of the entire operation. Even if it is in the entry-level price range, the Blue Wave Dredger Jr is not cheaply made. The parts are rigid and all the sensitives are covered properly. As a result, you can submerge the tool without any problem. The package also includes a reusable foam inlet that acts as a filter for the pool cover pump. Therefore, the cleaning process becomes a lot easier. The base of this pool cover pump is highly stable. It won't wobble or flip over even if the water level rises. Even if the ground gets slippery, it won't move over. You can also get a garden hose adapter here. This accessory simplifies the operation of the pump, making it usable on a household level. The WAYNE WAPC250 is one of the most powerful pool cover pumps today. It has exhibited multiple features that make it use simple yet ergonomic. The functionality of this device is due to the automated operation that it has. When the level on the cover reaches 2 1/8 inches, the machine will automatically turn on. It will then deactivate if the water level is already below 3/4 inch. These perks are all part of its innovative switch technology. Furthermore, you can just easily deploy and plug this pump without anything to do. It will just work on its own, leaving you free from obligations that you have to take care of it from time to time. This is among the solid features that pool owners love about the WAYNE WAPC250. We witnessed how it works, and by all means, this device is surely amazing. The WAYNE WAPC250 comes with a strainer on its base. The role of the latter is to ensure that water debris will be filtered out. The strainer also prevents clogging from happening. As a result, you don't need to worry about the pump being tipped over. Of course, the energy-efficiency of this pool cover pump is a guarantee that using it will never skyrocket your power bill. The capacity of the Pumps Away Genius Pool Cover Pump is pretty identical to the Blue Wave Dredger Jr. Both of them are capable of draining water at the rate of 350 gallons per hour. But unlike its counterpart, the Pumps Away Genius is an automatic unite. It will operate once it has detected a rise on the water level. This one is also fully submersible. It won't get damaged even if you let it stay under the water. Furthermore, this device is compatible with an ordinary garden hose. There is a hose attachment that accepts any type of household hoses for improve usage. The 25-foot cord ensures that you can connect this pool cover pump even to the farthest electrical outlet in your property. Aside from pumping water out of the cover, the Pumps Away Genius will also allow you to pump water out of the pool itself. It is an assistive tool for pool maintenance and cleaning. We have also noted that this machine has a stable base. The latter prevents the pump from being toppled once things get slippery. Maybe yes. Maybe no. These are the dissenting answers that we often hear from various pool owners. We can understand them, considering that this is not the priority on their mind. But the case should not rest there already. After a chief amount of pools, today have covers. These covers, on their own, are essential to preserving the cleanliness of the water in the pool. Once the cover is placed, you can guarantee that your pool will be free from any foreign objects that can harm its tidiness. However, just like we said earlier, the problem does not lie there. 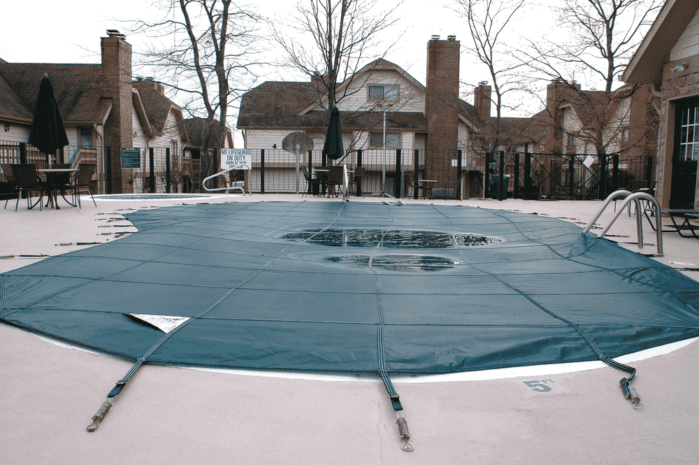 The pool cover needs attention, too, especially during cold and rainy seasons. Since it is an open and flat platform, water and liquid-based precipitations can accumulate there. Over time, the water would be too much to bear that they can cause the cover to collapse. Take note that water pressure is always a strong force to reckon. If you are situated in a region that typically rains of snows, investing on a pool pump cover is necessary. This particular machine should always be included in your standard pool maintenance kit. With this on hand, the pool cover will always be safe from damages and unwanted breakages. The role of a pool pump cover is very straightforward. It doesn't require a lengthy explanation or introduction. It is as bare as the broad daylight. Pool pump covers exist for the sole reason of keeping water out from your pool cover. But will it bring any good to your pool? And what if you just remove the water manually? Isn't it possible? Fortunately, we really love to answer these questions by delivering some honest facts. You see, it is not that easy to remove large volumes of water in the pool cover. Ordinary garden hoses don't have a built-in siphoning mechanism that you can utilize the expel all those water that have been gathered. Don't ever think that using a bucket or a pail can do the job. It will consume too much time and effort if you will insist on doing so. What if it rains continuously? Will you wait for the pool cover to collapse before you start doing some action? We know that you are not that irresponsible and daft to let these predicament slide off without implementing a solid solution. Pool pump removes the hassle of keeping the pool cove safe and whole. They prevent future nuisances that can make you scratch your head. Parallel to the things we mentioned above, a pool pump is there to prevent the pool cover from being sacked and wrecked by water during the winter season. We already realized that these covers are not cheap, especially if you are going to opt for large and high-quality variants. We never assumed that high-end pool covers are impregnable to damages. They have their breaking points that we want to avoid. Water can tear and break any type of pool cover. And if not, it will still cause a gradual reduction in the quality of the material of material over time. Let's be real here. Water is a universal solvent. It can get through things and break them apart. Constantly exposing tarp and solid covers to water can cause detrimental effects. Of course, you don't want this to happen. All of these amenities that you have are from your hard-earned money. Therefore, it is necessary for you to protect them at all cost. It is true that a pool cover pump is an added expense on your part. But having this on your side will guarantee you of long-term financial benefits. Excluding the replacement and maintenance cost in the equation is already a huge saving on your part. There are certain factors that you have to consider in buying a pool cover pump. But don't fret yet. Overall, choosing a pool cover pump is not a difficult process at all. You just have to be wary of these following things into account before you place your money in. In the market today, there are two types of pool cover pump: the manual model and automatic model. These two play the same function. They are there to expel the water out from the cover. However, there are distinct differences in their operation, which you need to understand first. Manual pumps are typically using siphon hoses that have a length of 13 feet or more. They work by having the ball being squeezed so that the pump can start dragging water inside the hose. Doing this procedure continuously will eventually remove the water from the pool cover. However, take note that the pace of manual pumps is quite slower than their automatic counterparts. Since they are not as expensive as automatic pumps, it is already given that their operation is not that speedy and consistent. But on the other hand, manual pool cover pumps run smoothly. The basic design ensures that it won't confuse its users. They are the practical route, too, because they don't consume electricity that much. Meanwhile, automatic cover pumps do the same job as manual pumps. The key difference here is that automatic pumps will drain the water out even without your supervision. Once the water reaches a certain level, the electric pumps crank automatically and start absorbing water in the process. It is already a cool stuff that you should witness. If you are being frugal as of the moment, there's nothing wrong with investing in a manual pump. Trust me. They work. You just have to be actively present in their operation. But for pool owners that are always on the go, electric or automatic models are the best options for the job. You should not buy a pool cover pump without gauging the size of your pool first. You need to do this so that you can assess the number of pumps and the power rating that they have. Of course, the bigger the pool, the more service you are going to need. You might need to get two to three pumps if you have an extensive pool. Meanwhile, smaller pools can bring justice to small manual pumps. The speed and efficiency of a pool cover pump are actually dependent on the GPH rating that it has. GPH, or gallons per hour, is actually a solid determinant of the capacity of the pump. It specifically tells how fast can the pump siphon the water out of the cover. We don't want things to get slow. Therefore, we should always go with the speedy ones. The higher the GPH rating, the faster the pump can eliminate water in the pool cover. We recommend that you should get pumps that have a GPH rating of 700 or higher if you have a large pool. For now, the best pool cover pump is already considered a pivotal tool for the operation of your pool. The existence of this machine already solved the age-old problem of damaged pool covers due to water accumulation. If the strength and rigidity of the pool cover can be preserved, then the water in the pool will be kept from harm. There are various options for a pool cover pump. The market is already teeming with these choices. But if you are having a hard time in your search, you can always try the units that we have featured here. They are already great right from the start. You don't need to raise your suspicions to them because they have been reviewed a lot, too! Did this guide help you? If you have some any question or concern, just drop them in the comment section below. We will try our best to get back to you as quickly as possible.